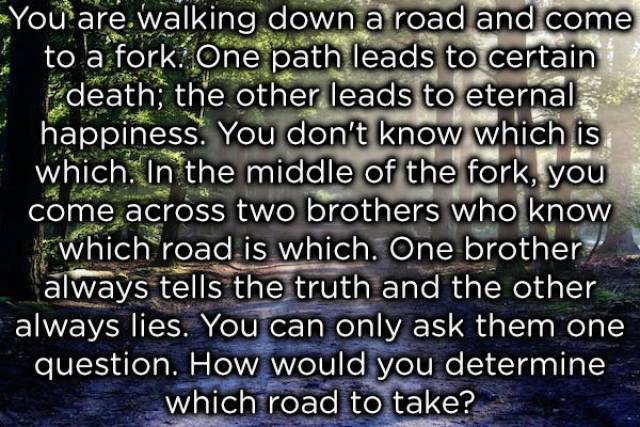 The answers are all at the end of the post. Feel dumb yet? No, that’s just me? Well here are the solutions, just to prove you were right. 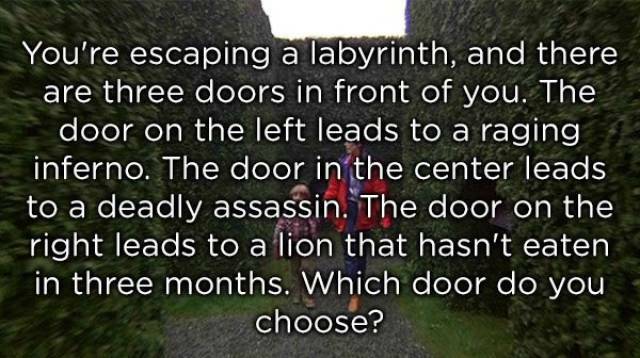 4) The door on the right. 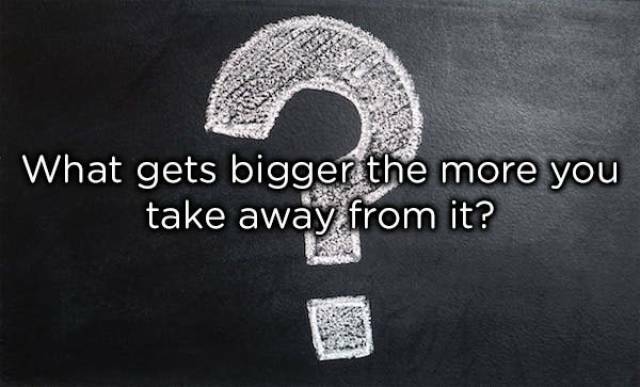 The lion hasn’t eaten in three months, so it’s dead. 6) 13112221. Each sequence of numbers is a verbal representation of the sequence before it. 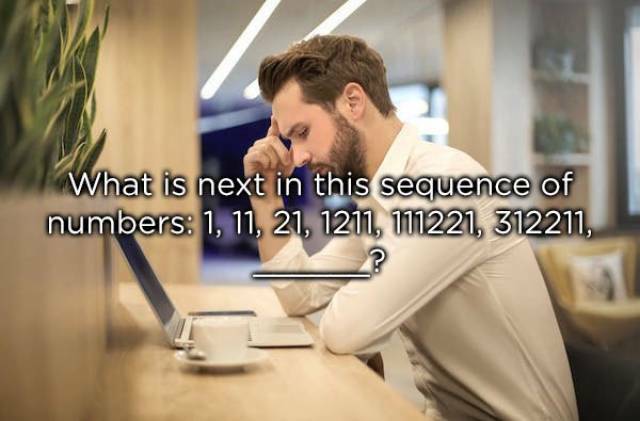 Thus, starting with 1, the next sequence would be “one one,” or “11.” That sequence is followed by “two one,” or “21,” and so on and so forth. 8) Take one gold piece from the first bag, two from the second bag, three from the third bag, four from the fourth bag, and five from the fifth bag. 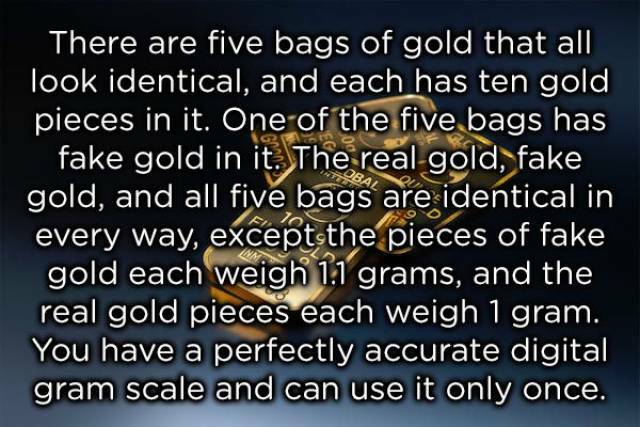 If the weight on the scale ends in .1, then you know the first bag has the fake gold. If the weight on the scale ends in .2, then the second bag has the fake gold, and so on and so forth. 9) 1. 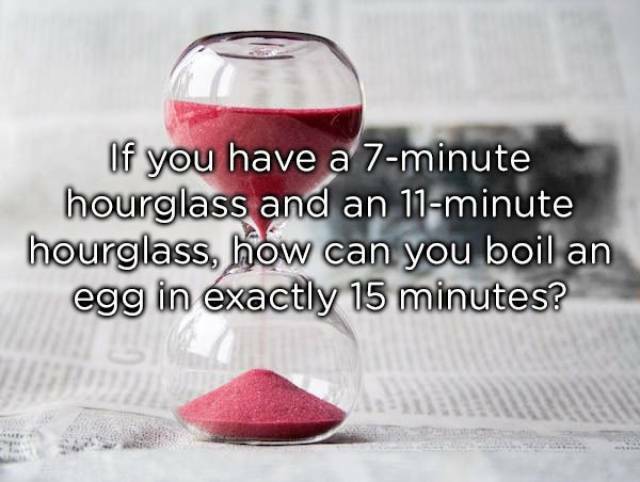 Start both hourglasses as you start boiling the egg. 2. After the 7-minute hourglass runs out, turn it to start it again. 3. Four minutes later, when the 11-minute hourglass runs out, turn the 7-minute hourglass again. 4. Wait for the 7-minute hourglass to run out, which will take another four minutes and get you to exactly 15 minutes of boiling time. 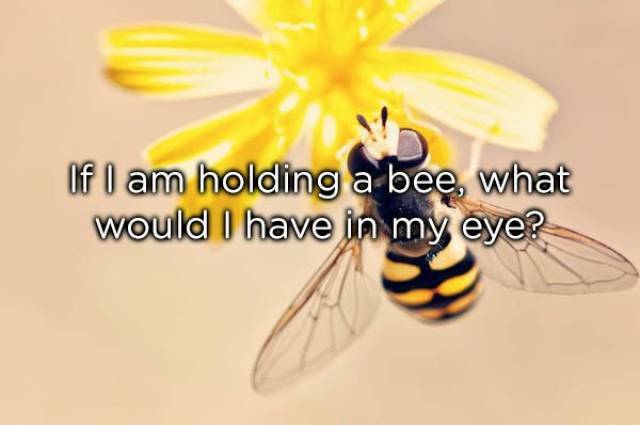 10) Beauty, because it’s in the eye of the bee-holder. 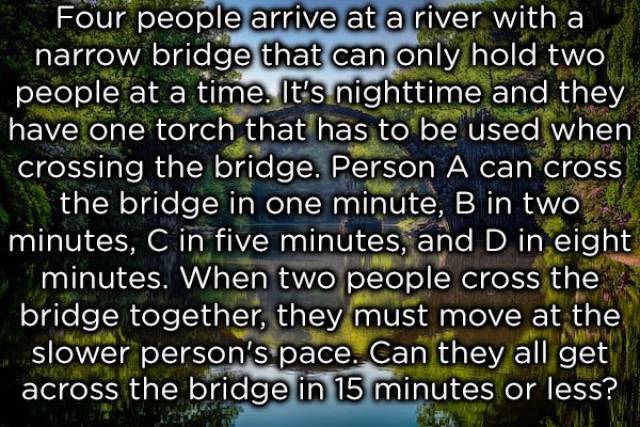 11) Yes, they can cross in exactly 15 minutes using the following sequence: 1. First, A and B cross the bridge and A brings the light back. 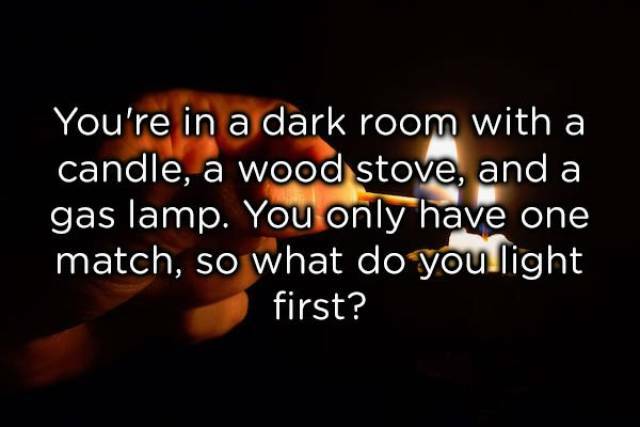 This takes 3 minutes. 2. Next, C and D cross and B brings the light back. This takes another 10 minutes. 3. Finally, A and B cross again. This takes another 2 minutes. 13) The three kids are 3,3, and 8-years-old. 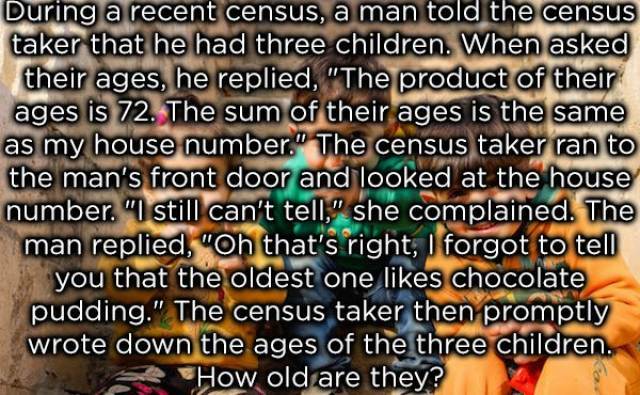 The key to this brain teaser is that the census taker looks at the house number. In other words, she knows the sum of the children’s ages. 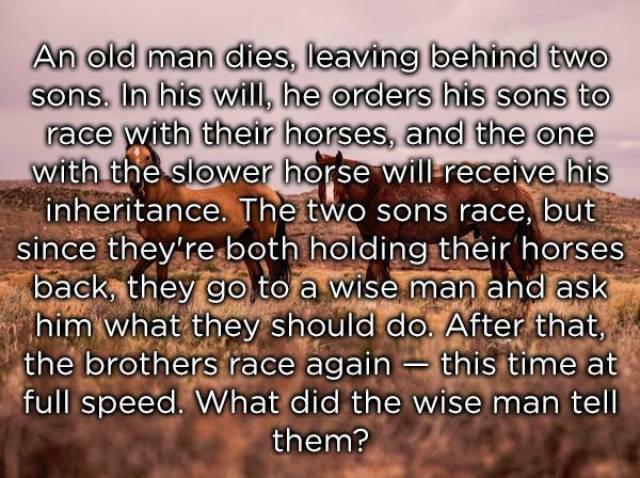 However, at that point of the riddle, she still can’t tell how old the man’s children are. 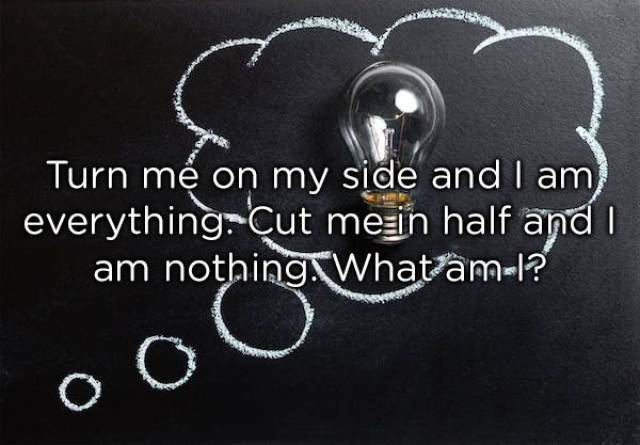 Therefore, she has to be stuck between multiple possibilities. To narrow it down further, only two sets of numbers that multiply to 72 share the same sum: (2,6,6) and (3,3,8). After the man reveals that his oldest child likes chocolate pudding, however, the census taker can differentiate between the two options. That is, only the latter of those two sets has a distinct “oldest” child. 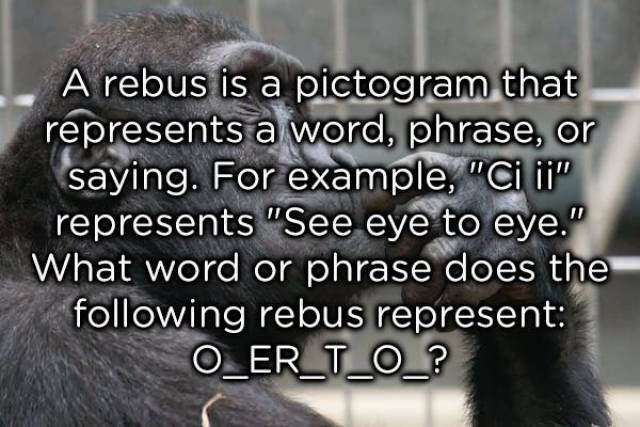 15) The letters missing in O_ER _T _O_ (OPERATION) spell out PAIN. 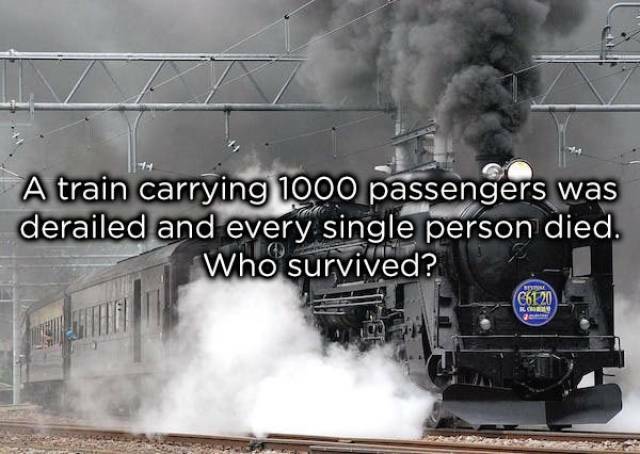 Thus, “pain-less” operation. #9 Start both glasses. When the 7 runs out put the egg in the water. When the 11 runs out (after 4 more minutes) start the 11 again. When it runs out the egg is boiled for 15 minutes.